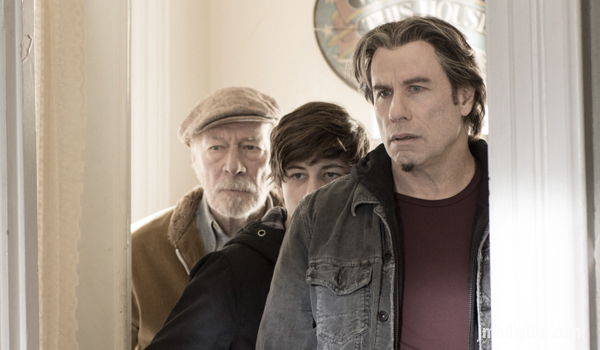 IT’S NEVER TOO LATE FOR ONE LAST HEIST... Two-time Academy Award® nominee John Travolta (Best Actor, Saturday Night Fever, 1977; Best Actor, Pulp Fiction, 1994) and Academy Award® winner Christopher Plummer (Best Supporting Actor, Beginners, 2011) take on the heist of their lives in The Forger, arriving on Blu-ray™ (plus Digital HD), DVD (plus Digital) and Digital HD on June 23 from Lionsgate Home Entertainment. The Forger is currently available via On Demand. An official selection at the Toronto International Film Festival, the thrilling crime caper also features rising star Tye Sheridan (Mud, Joe, The Tree of Life), Abigail Spencer (Cowboys & Aliens, This Means War, TV’s “Suits”), Marcus Thomas (Kill the Irishman, You Kill Me), with Anson Mount (Non-Stop, Safe, AMC’s “Hell on Wheels”) and Jennifer Ehle (Fifty Shades of Grey, Zero Dark Thirty, TV‘s “Pride and Prejudice”). The world’s best art forger (Travolta) makes a deal with a crime syndicate to get an early release from prison, but in return he agrees to pull off an impossible heist—he must forge a painting by Claude Monet, steal the original from a museum and replace it with a replica so perfect that no one will notice. He enlists the help of his father (Plummer) and son (Sheridan) and together they plan the heist of their lives. The Forger Blu-ray, DVD and Digital HD include a featurette going behind-the-scenes with the cast and crew of The Forger for a look at the making of the film. The Forger will be available on Blu-ray and DVD.